Ascension day, the general meeting was held at Rite Folkhighschool for the 15th time with 30 participants, including 10 Danes and representatives from the Danish Cultural Institute and the Danish Embassy. The school chairman, Brigita Lace and headmaster Niels Bendix Knudsen reported about activities in the past year, a little about the crisis in Latvia and the schoolwork in the springtime. There were shown pictures and movies from last year's courses. Simon Drewsen of the Danish Cultural Institute had helped in getting the school's regulations simplified and he was also chairman of the meeting. The simplified Statutes were approved and now it is also mentioned in these that the school offers activities for children and adults, which is important when the school seeks money in funds. According to the statutes now, there had to be elected 4 Latvians and 3 Danes to the Board. The Danish Culture Institute promised to make an animation course for children, like last year, supported by the Culture Institute. Unfortunately the school had received no answer to an application for a summer course for local children, so it was uncertain if there would be enough money, although there was support from the Danish aid group. But the local summer course for women would be held on the 10th of June and was supported financially by the Danish aid group. After the meeting there was the usual cosy conviviality, and the school thanked the chairman Simon Drewsen and Katja for interpretation. Before the meeting the Danish participants had been on an excursion of two days to Ludza and surroundings by the school bus. The group would like to see the border point at which Russia, Belarus and Latvia met. It was a trip into the woods where there was an unmanned borderstation and a large fence, with an alarm that could be heard, but no people were found, so our group turned the car and drove back along the woodland. On the asphalt road a borderguards car waited and the group had to follow it back to the local border station. Here we waited one and a half hour, and then the group got permission, which was issued to allow us to walk in the area for two days. 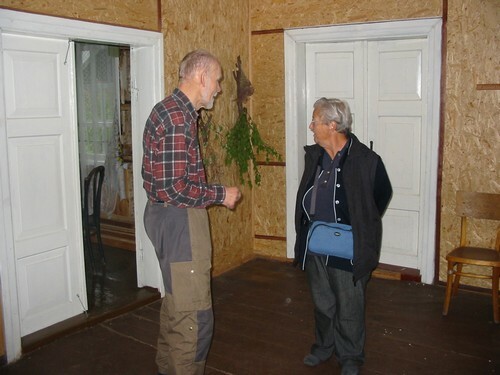 But otherwise, the purpose of the trip also was to visit the Dane Henrik Mollerup, who has a farm just outside Ludza. 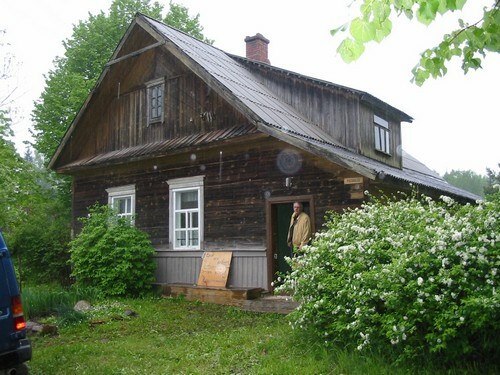 His farm is beautifully on hilltops with views of the Russian forests, and he even owns 200 hectares land with forest. The house and shed buildings were built of large thick wood sticks and Henrik has put new roof on the buildings and renovated rooms inside the house. Unfortunately he is plagued by theft, because he does not stay there so often. Again this time there was burglary and the thieves had taken good tools, they had picked new wooden board down from the wall and put it ready to take away. So now only dirty wallpaper could be seen. As Henrik said: When something is stolen every time, then you lose your interest in coming to the house. Henrik has had the property for 7 years and now he is thinking of selling it. 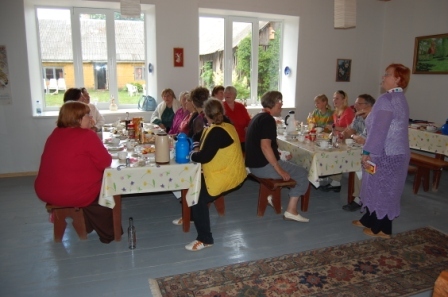 The group slept in a modern cottage with sauna and shower near the Nirzas lake, and the owners brought homemade dinner and breakfast out to them. All to reasonable prices. We had a row at the lake and listened to nightingales and saw the golden oriole. 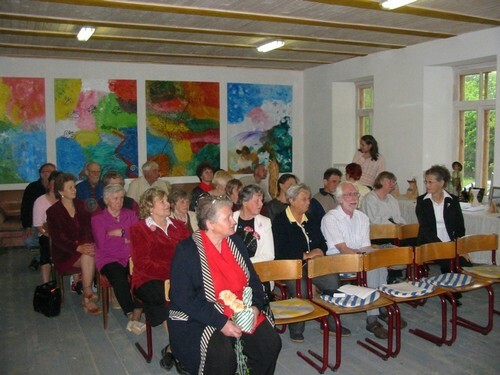 The project "Pensioners at school"
This year Rite Folkhighschool and the Folkuniversity in Karlskrona have applied for funds in the Nordic Council of Ministers, Copenhagen. And we have been so lucky to get the money. We want to start senior work in Denmark and Latvia from a working model in Sweden. 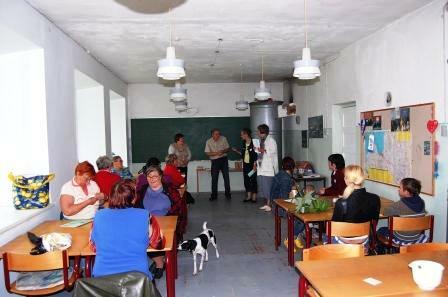 Pensioners with different working background should go to schools and help voluntarily as a resource for teachers. 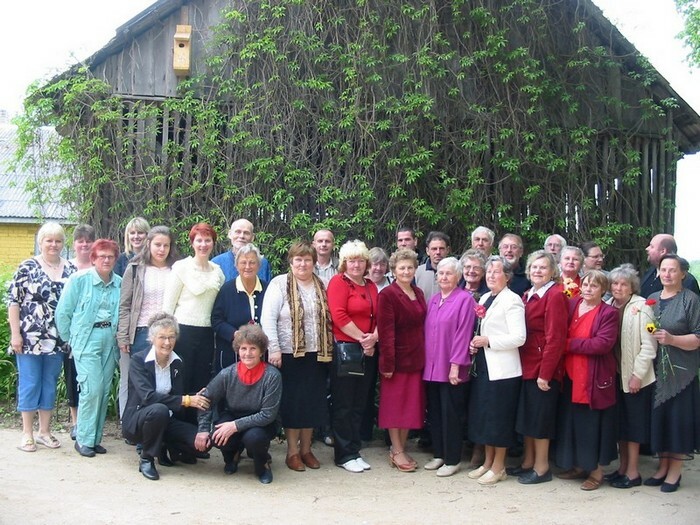 Pensioners are a big group which can contribute in different ways for a better society. Pensioners keep themselves healthier during time with children. The pupils also get better chances of a more balanced life during the contacts with other age groups. 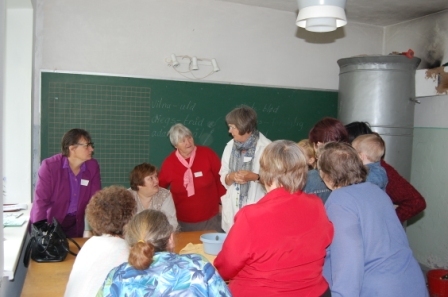 Before the pensioners come to the school they need to take an introductory course for one week in order to understand how the school functions nowadays. A project of this kind is running in Sweden with success and good dispersion, and we think it should be possible to transfer the idea to other Nordic and Baltic countries. In order to facility the project easily to many other countries and areas it is necessary to extract the exact tools and methods from the Swedish model. Sweden and tested in the two organisations in Denmark and Latvia. So in September 4 Danish and 2 Latvian teachers went to Sweden in one week were they visited schools and spooked with politicians and teachers to learn how to implement the idea to Latvia and Denmark. 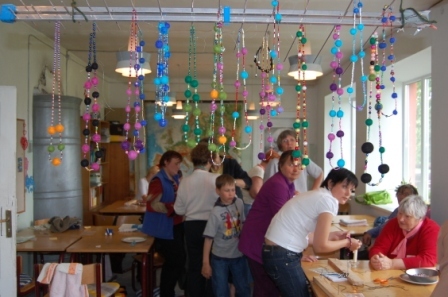 Rite Folkhighschool activities in 2009 culminated in the floristry courses of 5 to 6 December, attended mostly by local area women. The two-day courses were braided Advent wreaths, created flower arrangements and various decorations using natural bounty. Particular attention should be paid to the fact that the Advent wreath were used a wide range of materials in the process, except spruce branches. 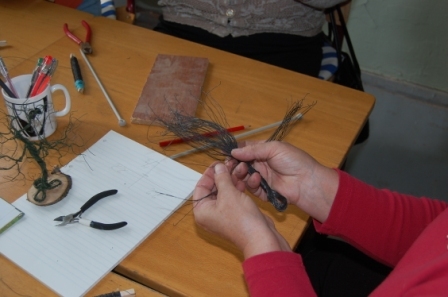 Floristry courses led by Sandra Trakina. Lovely works created in her leadership are displayed on photo gallery.